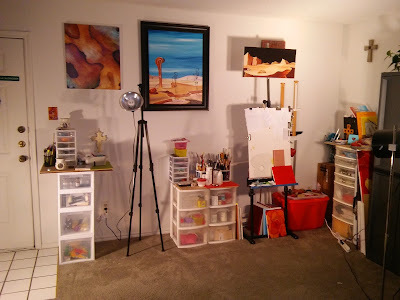 FINALLY....my studio is thoroughly organized. It sure did take long enough, but now everything is in place and I lived through it! I have several pics posted below that were taken in the evening, but I will take a few more this weekend with the blinds open…everything looks better in natural light. The small easel to the left without a painting on it will be used for oil painting. I have a small table to use for print making in that same area, so I guess it will be the print and oil area. The large easel on the right is the primary work station for acrylic paintings and projects. In the corner, but sorta hidden, are rolls of copper for some small art projects. The white drawer stands beside the easels are full of supplies that correspond to that particular work station. The black and gray storage cabinet was purchased from Walmart for about $80 and put it together with my friend. That cabinet holds some new canvases, smaller boxes of new supplies, and all of my tool boxes and Dremel are at the bottom. 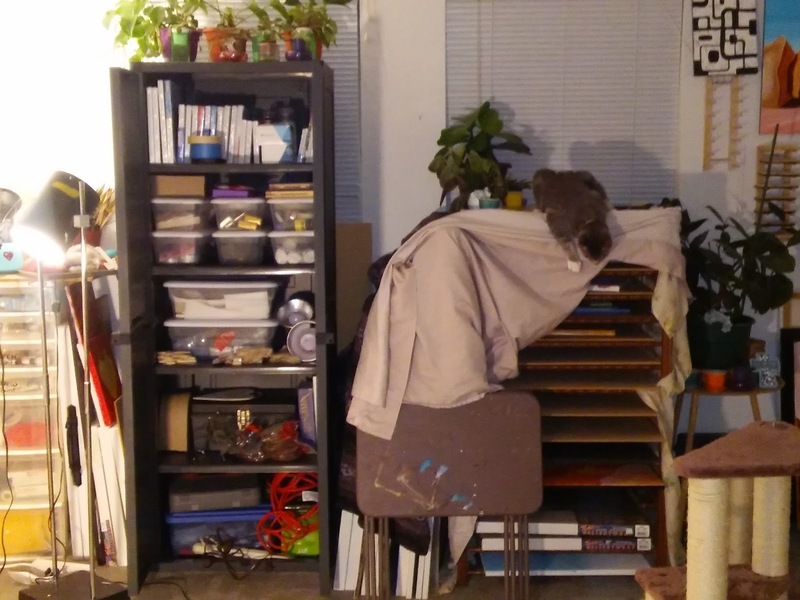 The painting rack, that the cat loves, is a baby bed that has been turned sideways with mdf boards as shelves. I keep a few new canvases in there, but for the most part it is strictly for finished paintings.....I drape it with old sheets to keep dust off the new works.